Stamp collecting began almost immediately after the issue of the first adhesive postage stamp. Great Britain issued the first postage stamp on May 6, 1840. 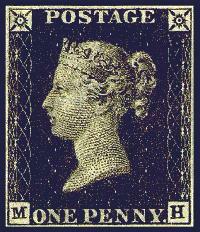 It is referred to by philatelists as the Penny Black (see scan below). Many people purchased the 1 Penny stamp on the first day of issue, not for the purpose of using it on letters, but for the purpose of saving them as historical mementos. From the 1860's the hobby really caught on, especially among children and teenagers. Many of these young enthusiasts went on to write books about their philatelic studies, and are among the "giants" of philatelic history that we recognize today. The first stamp albums appeared in the 1860's, when Worldwide collecting was still a very small endeavor. This hobby can be enjoyed by everyone, though many collectors have also been kings, queens, and presidents. This hobby can be as inexpensive or as expensive as one desires. The costs can range from a few dollars to the millions of dollars required for complete collections of some countries! Queen Victoria's grandson, as a youth, began to save the stamps that came into Buckingham Palace on official mail. He went on to become King George V, and he was an avid collector throughout his life, even participating in many philatelic auctions during the time that he was king. King George V even submitted an auction bid for the unique British Guiana 1 Penny Magenta, but he was outbid and didn't win the auction lot. In the United States, President Roosevelt was also an avid collector. The purpose of this section is to define and to present a broad overview of the hobby. Detailed articles on the general aspects of the hobby are presented at the right. Please click on the links to review each of these articles. Detailed information on stamp specialties will be featured in "collecting" categories of this site, and they can be accessed though this page's navigation bar. A new Frequently Asked Questions page has recently been added, so visitors can submit general questions about basic stamp collecting subjects. Some of the other collecting categories will also contain Frequently Asked Question pages, for those with more advanced philatelic questions. If you would like to share an interesting story about your experiences with this hobby or comments about this page, please submit your article by clicking on the following link. It is very easy, and you will have your own page on this website to share with other visitors. CLICK HERE to submit your story or to view pages that other visitors have submitted. Why Collect Stamps? The usual reasons are personal enjoyment, personal gratification, and a sense of accomplishment. Through collecting, one can gain greater knowledge in history, geography, cultures, beliefs, and possibly a greater understanding of other languages. The first article below is my philatelic autobiography - a story of my life's journey with stamp collecting. Similar contributions from visitors would be welcomed, and they will be published here.